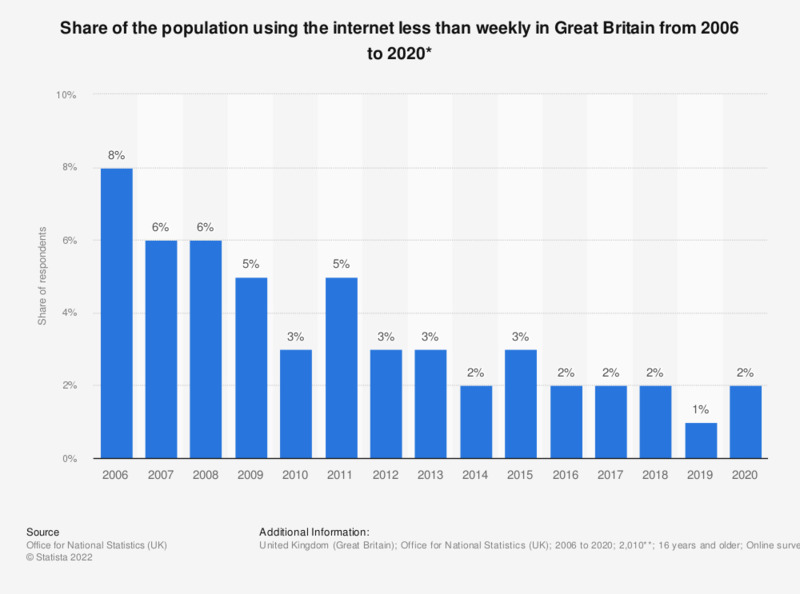 This statistic represents the penetration of less than weekly internet use in Great Britain from 2006 to 2018. In 2018, two percent of Britons used the internet less than weekly. Penetration of less than weekly internet use fell from 8 percent in 2006. * Those who use the internet less than weekly, but have used the internet within the three months previous to survey. ** The source indicates: "The source of this information is the Opinions and Lifestyle Survey (OLS). The OLS is a multi-purpose survey developed by ONS for use by government departments, other public bodies, charities, academics and the media. It provides a fast, cost effective and reliable way of obtaining information on topics too brief to warrant their own survey." *** The Opinions and Lifestyle Survey is carried out by interviewing a nationally representative sample of households in Great Britain. About 1,800 households are sampled each month and estimates are subject to sampling variability, as are those from all sample surveys.